Accelerating aging research to extend healthy productive lifespan seems to be in everyone's best interest. There are few people on this planet, who would chose to age and gradually succumb to diseases of aging if they were given a choice to live longer and healthier lives. However, up until recently, the many failed promises of science made many of us resistant to accepting the possibility of the interventions that may take us way beyond the lifespans of our parents and grandparents. Well, now it is time to open up to these possibilities and get actively involved, because the urgency to accelerate aging research now stems from the economic fundamentals of the aging population in the developed countries. Aging populations in the developed countries are now the single biggest threat to the global economy. People that are retiring today and that are due to retire in the next decade are going to live extraordinarily long lives due to the advances in biomedicine and propagation of these advanced into the clinical setting. 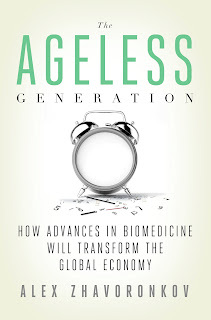 "The Ageless Generation: How Advances in Biomedicine Will Transform the Global Economy", a book by Alex Zhavoronkov, PhD in very simple layman language drills down into the history of retirement and social security and the present state of the social security, healthcare and the unfunded liabilities of the developed countries. It also takes the reader on a tour of the laboratories in the US, Europe and China, where scientists toil on solving the complex puzzles of regenerative medicine, longevity genes and technologies that will extend our lifespans. Then it looks at the future of retirement and presents the real possibility of the near-term Economic Collapse. There are some solutions and policy proposals, but chances are very small that we will be able to avoid the crisis before we can significantly extend healthy lifespans. The book will be published by Palgrave Macmillan in June 2013 and is available for pre-order at Amazon and most bookstores worldwide. The main idea of this book is that in record time the US must start a coordinated program to increase healthy productive lives of the two generations that are nearing retirement or the whole world will face several decades of economic decline and possible collapse. The need to fight aging is no longer an altruistic initiative, but a real economic necessity. Recent advances in biomedicine will extend the lifespans of the two generations due to retire within the next twenty years; however, unless there are programs in place to keep them healthy and working, the burden of the aging population will drive the global economy into the state of depression or even worse. Developed countries should re-focus the research programs from just extending lifespans to extending health spans and the retirement age to remain solvent and this initiative must be led by the beating heart and the brain of the world's economy - the United States of America. Every reader of this post must consider the possibility of radical extension of healthy life through biomedicine. One thing you should do right now is to stretch the expected horizons to 150 years. Yes, it is possible! Even if we let some of the major advances that already happened to converge and reach the clinic, 150 years of life is the very minimum of what a 40-year old today should expect. One way to prepare for it is to pack up and prepare yourself and your family to live through the economic collapse. Another way is to actively engage in supporting aging research by engaging in government lobbying, supporting research directly or even engaging in research personally. Sleeping by the side additionally prevents back again & throat discomfort as well as reduces loud snoring. The main downfall of this position is it causes wrinkles as you've to put your face around the pillow. Advice for Better Sleep- Ladies that adore resting by their own aspect also risk getting sagging breasts. If you happen to are afflicted by acid reflux disease as well as resting on the back doesn’t seem comfortable for you, kindly try this position. Michigan labia plasty encourage visitors to sign up for their health treatment in addition to medical style. In a single in our individual research, ladies had been asked; perform ladies want to be loose or perhaps calm or perform ladies want to be limited? Women answered 100% -- girls want to be tight. LVR might achieve whatever you wish.